The old cliché goes that “A picture is worth a thousand words”. This may be overused, but I feel this is particularly relevant in data analysis, and we often use diagrams as tools to quickly communicate the results of our complex statistical models. However, whilst we often prioritise on explaining the results of the analysis, we are often less inclined to explain the stages used to reach the results to the same level of detail. In this post, I highlight some of the great features of making diagrams in R, and highlight how they can be easily connected to data from your analysis to produce dynamic data flowchart. This can make it much easier for readers to engage with your data analysis and understand how your complex models work. While this guide by no means attempt to replace the detailed guidance provided on the package website, it is important to highlight a few of the basic features of the plots. 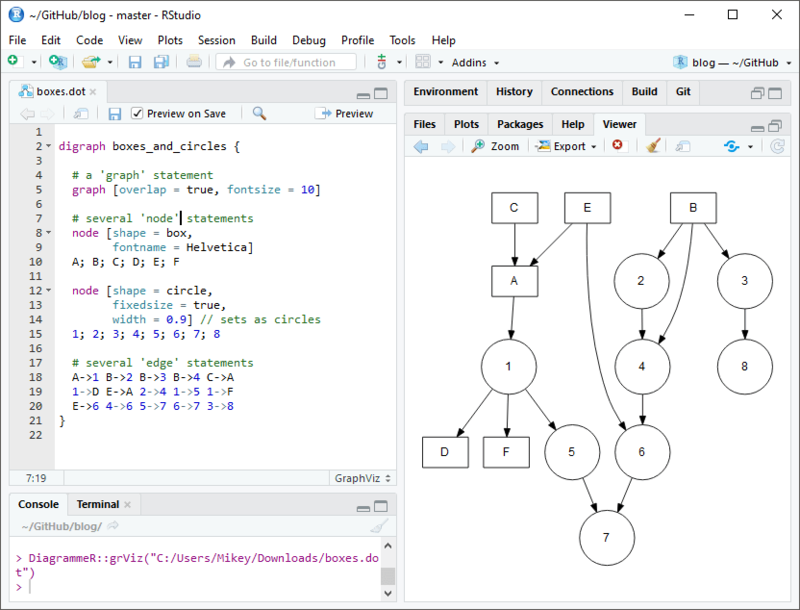 DiagrammeR uses the processing function called grViz(). What you pass into grViz() is a valid graph specification in the DOT language, with the figure being supplied as either an external file or inline code within R.
This post is not designed to be a comprehensive guide of DiagrammeR, but it is worth highlight that we can use subgraphs and clusters to demonstrates groups within the data. Figure 5 highlights an example of a graph I have produced within my analysis to show the classification of data across different categories within my model. The code used to make this graph is available through the GitHub repository here. If you want to read the full documentation of the package you should check out the website here: http://rich-iannone.github.io/DiagrammeR/ . The features extend well beyond what is explained within this brief post. If you have made any data-driven R Markdown graphs, I would love to see them! Feel free to share any examples of using it in the comments below. Iannone, Richard. 2018. DiagrammeR: Graph/Network Visualization. https://CRAN.R-project.org/package=DiagrammeR. Data scientist with interests in data visualisation, machine learning, geospatial modelling, energy and international development. Book Launch of “A Village Inheritance"